No. 2 Norcross knocked No. 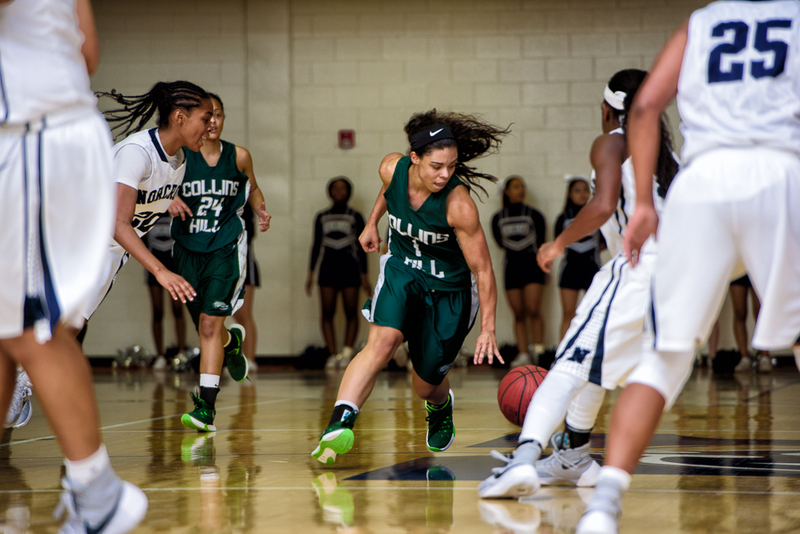 3 Collins Hill from the unbeatens in AAAAAA with a 55-45 win at home on Tuesday. The Lady Blue Devils have now won eight straight and the two teams swap positions in the top three. No. 4 McEachern rolled Marietta (14-6) by a score of 63-40 in an otherwise uneventful week of action. Glynn Academy takes over the No. 1 ranking in AAAAA following No. 5 Brunswick’s 49-43 slip up against Camden County (15-6). The Lady Pirates fall behind No. 2 Sequoyah, No. 3 Southwest DeKalb and No. 4 Flowery Branch, a tough field. Sequoyah drilled River Ridge 50-38 at the War Lodge last Tuesday. Sophomore point guard Alyssa Cagle finished with 18 points before sitting out the fourth quarter. Defending state champion Stephenson (13-7) falls out of the top ten. Stephenson has lost three straight including a 60-53 loss at Mays. The Lady Raiders (14-6) are still in search of their first top ten appearance in weeks even after winning their state title rematch with the Jaguars. No. 10 Gainesville makes the poll and are currently 10-0 in Region 8. The Red Elephants handed No. 4 Flowery Branch its only loss of the year 60-48 on Jan. 8. The two meet at Gainesville this Tuesday to decide the No. 1 seed heading into the region tournament. No movement occurred in Class AAAA and AAA. No. 1 Buford has won 11-straight while No. 5 Mt. Zion has kept pace with 13-straight wins. Long winning streaks are in vogue in Class AAA as well with No. 1 Morgan County (14), No. 2 Jackson (17) and No. 3 Kendrick (15) all riding double digit streaks. No. 5 Laney holds its place in the top five following a 72-51 loss to 1A-Private No. 1 St. Francis. In AA, Putnam County jumps from No. 9 to No. 5 following a 51-38 win at No. 7 Bleckley County, who falls two spots. Vidalia tumbles from No. 7 to No. 9 after a 58-57 loss to Swainsboro. The Tigers swept both the boys and girls Vidalia teams, huge wins for the program. Vidalia attempts to bounce back as they visit No. 6 Jeff Davis on Tuesday. The Lady Indians crushed Jeff Davis 70-52 in their first meeting. Class A-Private saw ELCA (10-5) drop out of the ranking after a 41-32 loss to No. 6 Our Lady of Mercy. Replacing the Chargers is No. 9 Lakeview Academy. In Class A-Public, it is Quitman County plummeting out of the top ten following three straight losses. Replacing them is Woodville-Tompkins at No. 10. No. 5 Commerce beat A-Private’s No. 9 Lakeview 62-50. No. 4 Calhoun County lost to AA No. 4 Pelham, 64-46. No. 2 Taylor drilled No. 8 Greenville 69-45.